Over the past few weeks, the Ministry of Education (MOE) has been investigating reports of the sale of fake diplomas by a person identified only as the “Diploma Guy”. 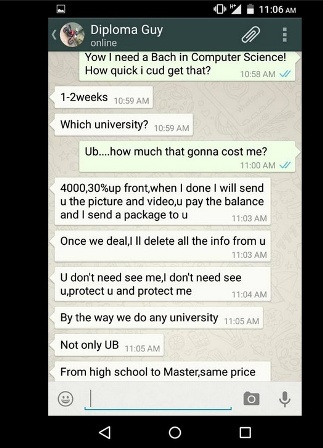 The evidence of the fraudulent act surfaced on the popular social media network, Facebook, where a conversation between the “Diploma Guy” and a potential buyer stated that a fake diploma can be bought for $4,000. The conversation continued to state that fake diplomas can be bought from any secondary or tertiary institution in Belize, the United States of America and Europe. Upon learning of these activities, MOE quickly launched an investigation and released a statement on the matter. According to the press release “The MOE informs the general public that any person found in possession of any such documents under the Belize criminal Code will be liable to imprisonment for two years and those found guilty of being a common forger is liable to life imprisonment.” The release also urged all establishments and educational institution to scrutinize any diploma presented to them, and if suspicions arise on the legitimacy of the document, they are to contact the MOE. Faber also stated that while fake diplomas are not common, there have been some incidents involving secondary institutions issuing diplomas to students that do not deserve them. “We have had some incidences of schools issuing diplomas, mainly high schools, to people who did not earn those diplomas. So, I urge the managing authorities of schools to be very strict on their policies as it relates to this. I haven’t heard it being done at tertiary level institutions, but if it is being done, it is being done outside of these institutions and not necessarily encouraged by these institutions,” said Faber. The most direct way to verify the authenticity of a diploma is to contact the institution which issued it, as records are kept of all students. To report any inconsistencies, contact the Ministry of Education at phone number 822-2380/3315.